Every year, hundreds of University of Miami alumni visit the Coral Gables campus to reminisce on memories of a place they once called home. For one UM alumnus, walking through campus, the same place nine years ago he called his home, is now part of his job. 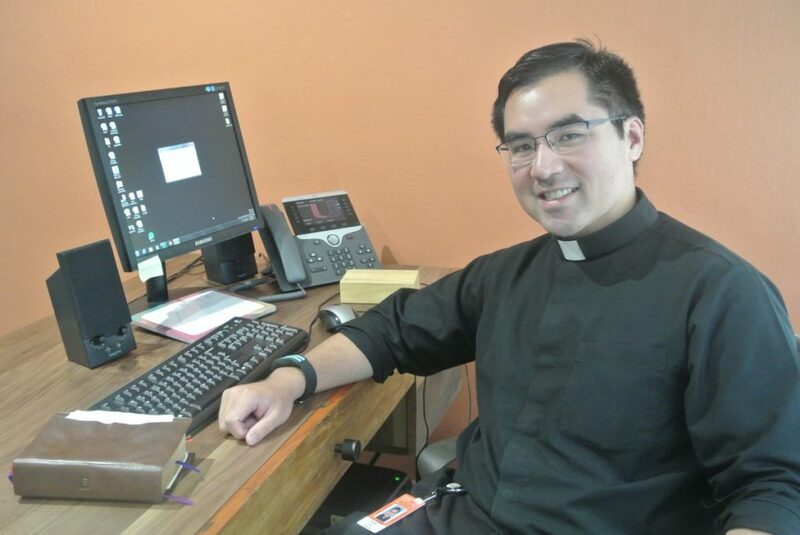 Father Phillip Tran, a 2008 graduate, has become UM’s first full-time priest. Across the country, Catholic ministry centers, called Newman Centers, can be found on secular universities. These centers are intended to provide the university’s Catholic student population with religious services. At these centers, full-time priests are on staff. UM does not have a Newman Center but rather, a community parish. St. Augustine Church, houses UM students and provides religious services geared toward students but primarily focuses on serving the community, not UM exclusively. Less than a month ago, Tran arrived on campus to begin his tenure. As he made his way through campus the week before the official start of the semester, Tran remarked on the similarities and differences on campus since his freshman year as a student in 2004. The Rathskeller, once a “dive bar,” looks nothing like it used to, he said, but is still a great place to have a beer and play pool – two things he hopes to do with students in the near future. “I always tell people, ‘don’t ask me about my college days,’ but that’s really funny because it looks like the rest of my days are going to be college days,” Tran said. For Tran, a South Florida native, becoming a priest was far from his mind when he first started at the university as a neuroscience major. While a student, he admits the Catholic community on campus wasn’t the best. He said he often felt he couldn’t speak to his priests. Still, Catholicism and faith had always been a major part of his life, dating back to a time when his father nearly became a priest in Vietnam. When North Vietnam invaded South Vietnam during the Vietnam War, his father was thrown into prison for practicing Catholicism. After three years, Tran’s father managed to leave and immigrate to the United States. In the U.S., he met Tran’s mother. According to Tran, it was his parents’ faith that kept them joyful despite having very little. According to Adam Wahl, president of the University of Miami Catholic Campus Ministry, throughout the school’s history, Catholic students at the university have had to deal with a revolving door of priests. Wahl said he thinks this has lead to students having difficulties forming direct relationships with their priest, the same way Tran felt while he was a student. Now that they have a full-time priest, Wahl hopes it will form a tighter bond amongst the ministry, as well as allow for more interactions between other student organizations. He stressed the importance of finally having someone to represent the Catholic Ministry in interfaith dialogue. A neuroscience major himself, Wahl finds himself relating to Tran already. For Dr. Patricia Whitely, Vice President of Student Affairs, assigning a Catholic priest to the university was a top priority. Tran was informed about his new appointment a month ago and moved from serving at the nearby Church of the Little Flower in Coral Gables to his new office in Pentland House behind Hecht. Sudden change is something that comes with the title of being a priest, according to Tran, who said priests are sometimes expected to drop everything when given a new assignment. “This is like a prototype assignment but the basic goal is to bring the presence of God to all the Catholics here on campus,” Tran said. Tran already finds himself getting started on his duties here at the university, being stopped by students asking to do a confession as he walks through campus. Though many students are excited about having a full-time priest on campus, Tran admits to getting confused stares from students as they see him walk by. However, Tran said he hopes to make an impact on all students as a source of answers and discussion that he sought out but didn’t receive during his time as a student. “We find God in friendship too,” Tran said. Along with religious events, he hopes to reach out to the entire student body through kayaking and beach days, some of his own personal favorite activities.